This page is a log of web updates and activities. 8/4/02 Worked on Vibrand news to home page. 7/28/02 Added Solar Systems page and Solar Grid Tie page under products and Services. 7/14/02 Added Slab City USA page. 6/22/02 Changed price on SCI Mark 2/20 regulator. And info on trace C60 regulator. Reinstalled Trellix software to new computer in order to make above changes. 5/5/02 Added UPG 1300, US 65, Mark 3/15, C40, C30A, Boost, and other photos to the photo's page. 4/26/02 Check and replaced link to clean power estimator on Determine Your Needs page. Updated solar panel prices and regulator prices. 3/19/02 Wrote and posted information on sizing batteries. Checked links on sizing page. 3/15/02 Wrote and posted information on sizing and choosing the right inverter on the Determine Your Needs page. 1/19/02 Added a photo page and some photo's (annotated). 12/14/01 Changed prices on panels and regulators. 10/10/01 Added six more links to the links page. 10/8/01 Added Interstate Renewable Energy Counsel to links page. 9/28/01 Added links to: Trace Engineering controllers, Specialty Concept Controllers, and Unisolar Solar Panels. Pasted J. Kathleen's Sun Oven Recipes on the Sun Oven product page. 9/25/01 Added new "Links" page and included several links on the links page and on the "Determine Your Needs" page. 9/17/01 Added Solar Fountains page under the Products and Services Page. 9/13/01 Added about us page and transferred text from Home Page to it. Changed text in Contact Us page. 9/12/01 Added link to Heart Interface on inverter page. Added Constant Contact Links to all the web pages. 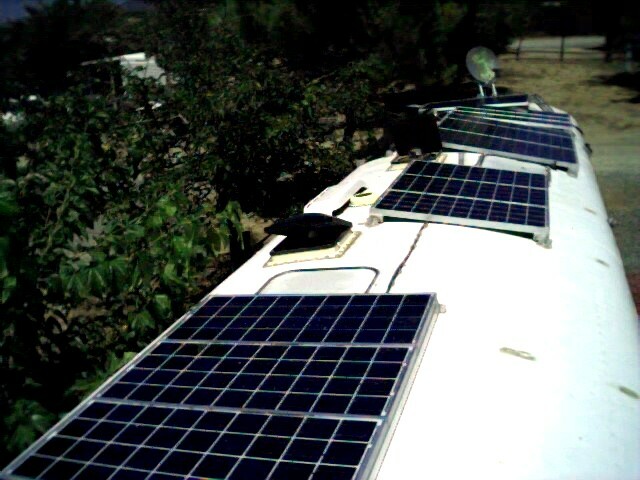 Checked out links inverter, regulator and solar panel links don't work after publication. Republished and now they check out. 9/10/01 Began this Webmeister log page. Check links on Web Site. Check number or hits on stats page 909 in September. Added links to Inverters page Trace RV series, SW series and Advanced energy inverters. 9/03/01 Added constant contact Emil logo on contact us page. 8/15/01 Transfer web hosting from" world wide web institute" to "value web"
and constructed a web site using Trellix Web software and templets.